Exploring the scale R/C landscape with 19 fully-capable off-road platforms. There’s no doubt that one of the hottest areas of the R/C hobby has been, and continues to be, the “scaler” scene. While the term may be a bit misleading (if not confusing), “scaler” refers to a radio-controlled vehicle that may be of the mid-to-small-scale variety, but it includes details and visual accessories that mimic what you’d encounter on a 1:1 automobile. Owners of these scale R/C rigs have embraced this segment of the hobby and numerous competitions, and get-togethers have sprung up to celebrate and share the love for these tricked-out trucks. events perfectly blend Passion for off-road automobiles with outdoor adventures that can range from relaxing to challenging. My own personal interest in radio-controlled machines leans toward the scale side, as it allows me to establish a dream garage on a much more manageable budget versus filling a 1:1 garage with 1:1 cars and trucks. From high-detail to spartan design, there are many different models available in the scale R/C category. While there are some similarities between the different makes and models, you’ll quickly notice some unique features that set each one apart. If you share this love of off-road machines, attention to visual details, and exploring the great outdoors, this genre might be the perfect fit for you. Here are an array of models, in ready-to-run (RTR), kit, and bind-and-drive (BND) configurations, which are perfect for getting you on the trail. As R/C lineage goes, Axial could be considered the father of the “scaler” (or at least one of the brands which have taken this pocket of the hobby to greater heights). Their SCX10 platform has been around the block…and the trail and has been tuned and tweaked through various model updates. Pricing for the various SCX10 models can vary based on the package and body style, but no matter what option you choose, know that you’re getting a solid scale R/C machine. Note: Changes to this lineup have removed some of the body style options and kits are no longer offered in the “classic” style. That’s not to say that they can’t be tracked down online, however. In 2016, the second generation of this popular trail rig was released, as the SCX10 II became available in both a ready-to-run (RTR) and kit versions. This new model brought some changes to the platform on a chassis level and gave scale and trail rig fans a new body to work with, in the 2000 Jeep Cherokee Sport. Why Choose the Axial SCX10 II? Although it doesn’t have the same trail-tested history of the SCX10, Vaterra’s Ascender scale rig platform has quickly developed a passionate following among R/C enthusiasts. Although there haven’t been many updates to this model line since their latest model release (1972 Chevrolet K10 Pickup), however, that hasn’t slowed down the popularity of this vehicle. There’s no denying that Vaterra has put time and thought into this model and has brought some unique perspectives to the world of scale R/C machines. With features such as adjustable wheelbase configurations and small visual details sprinkled throughout the bodies of the Ascender lineup, they came out of the gate strong and have kept their momentum rolling. As you look at the vehicles that make up the scale radio-control scene, you’ll notice that some take their idea of “scale” much higher than others. RC4WD is one brand that I’d throw into this category, as they have been crafting impressive amounts of detail into each of their scale machines for quite some time. Intricate details are not only found on the bodies of the Trail Finder 2. Leaf springs, realistic transfer cases, and stamped beadlock wheels are among just a few of the chassis-centric Items that you’ll discover on this model are in line with what you’d find on 1:1 vehicles, and is part of the draw to the models in the RC4WD lineup. Why Choose a Trail Finder 2? Why Choose the Gelande II? If basic body styles and a no-frills approach to “scale” are what you prefer, the Sawback from GMade might be an attractive option. Featuring a Willys Jeep-inspired body, the Sawback features adjustable chassis components and is available in a variety of model options. Why Choose the GMade Sawback? The folks at GMade followed up on their success with the Sawback by releasing a scale rig that not only featured a modern design, but it was decked out from bumper to bumper in accessories. The Komodo Looks like a truck that’s ready to take on the wildest outdoor adventures and conquer whatever lies in front of it. Accessories such as a beefy front bumper, roof rack, and side mirrors are all included, making this an impressive package. Why Choose the GMade Komodo? The Tamiya brand is synonymous with the R/C hobby. From the early Days of the hobby through now, they have consistently created memorable vehicles that feature both detail and durability. While their “scale & trail” models differ in construction, That doesn’t mean they’re less capable. From the molded plastic chassis design to the attention to detail that’s applied to each body option, the Tamiya CC01 is a blend of old-school radio-control and trail-ready performance. Why Choose the Tamiya CC01? Known first for their drift and on-road models, MST is making a name for themselves in the scale/trail arena. Their first of two 1/10 radio-controlled scale rigs is the CMX. Available as both a kit and an RTR, this model features the same basic ladder-frame chassis and internal components that you’ll find with some of the “household names”, but at a lower cost. Why Choose the MST CMX? Following in the tire tracks of their CMX 1/10-scale rig, MST rolled out the CFX lineup, which shares many of the same body options as the CMX. The main differences between the two models can be found under the bodywork. While the CMX utilizes a traditional, mid-motor configuration, the CFX features a front-mounted motor and gearbox, as well as some other chassis-level refinements. Why Choose the MST CFX? When the first images of the HPI Venture began making the rounds, much of the speculation centered around the brand that would produce this model. For a while, most signs pointed to Traxxas, which turned out to be wishful thinking. As fate would have it, however, Traxxas has decided to throw their hat into the ring of scale R/C with the launch of their TRX-4. Teased in early 2017, this full-featured model is the first attempt at a vehicle that’s not meant to jump insane heights, land, and have the process repeat itself. Many hobbyists have gotten their start in the hobby through Traxxas vehicles, myself included. I’m excited, as both a hobbyist and a fan of the hobby, to see what they’re able to bring to the table. With the “mainstream” brand recognition that they’ve managed to build over the years, there’s no telling how many new scale radio-control fans might flock to this genre of the hobby. Why Choose the Traxxas TRX-4? If all of these options weren’t enough, another big player in the world of R/C has thrown their hat into the “scaler” world with not one, but two 1/10-scale options. Carisma Scale Adventure, an offshoot of Carisma RC, has snuck onto the scene with an incredibly capable rig, judging purely by its performance at a recent RECON G6 endurance test (Pro-Line’s “The Fix”). With an old-school body and a solid chassis design, this is a great option for those who want something a bit different (yet dependable). The price doesn’t hurt either, as this is in-line with the cost of an Axial SCX-10 Deadbolt. Why Choose the Carisma Scale Adventure SCA-1E? Trail-tested design that can stand up to extreme conditions. Shop for the Carisma SCA-1E on Amazon. When the first photos of the HPI Venture were posted online in early 2016, speculation began to fly regarding what brand was behind this yet-to-be-launched scale rig. As details became clear, the thought of a new model option ripped through the scale R/C community like wildfire. Over a year has passed since the original details of this rig were announced, but at that time, a mid-2017 release date has been announced and pre-orders are available. Why Choose the HPI Venture? A fresh new take on radio-controlled scale rigs by a name that’s within the R/C world. While two new models from two new faces in the scale R/C world would have been enough, a third name has also joined the ranks. 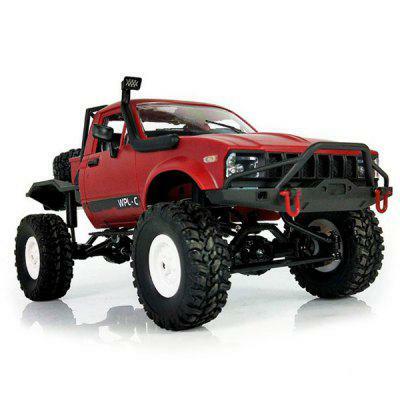 Redcat Racing is no stranger to the R/C crawling world with their RS10 Rockslide and Everest-10 models, however, they haven’t offered a true, ladder-chassis, “scale” rig…until now. Their entry into the world of radio-controlled trail rigs will be ushered in with the Everest GEN7. In a departure from their other models, the Everest GEN7 will use be comprised of a few components sourced and designed by outside vendors. This, coupled with the fact that Redcat Racing has been gaining notoriety for their durability, has my hopes and expectations quite high for this model. Why Choose the Redcat Racing Everest GEN7? Shop for the Redcat Racing Everest GEN7 on Amazon. While the Everest GEN7 ushered in a new approach for Redcat Racing, the GEN8 Scout II raises the bar for this Arizona-based company. This rig sports a refreshed chassis design which applies portal axles, improved approach angles, an updated driveline, and a body style that’s a favorite among old-school off-road fans, the GEN8 looks to shake up the market. What makes this rig even more impressive is the price. At $299.99, the GEN8 is one of the most affordable 1/10-scale R/C crawlers on the market, all while offering some “big ticket” options. Why Choose the Redcat Racing GEN8 Scout II? Improved ground clearance and approach angles over the GEN7. If you want a ready-to-run rig with its unique body design, this model offers just that. An array of upcoming aftermarket parts offered by Redcat Racing. Known more for their on-road and off-road “go fast” R/C vehicles, HoBao Racing is exploring the radio-controlled scaler market with their DC-1 kit and RTR models. With looks that rival that of the Traxxas TRX-4, The DC-1 appears to be a solid competitor in the scale R/C market. Why Choose the HoBao Racing DC-1? An alternative to other mainstream brands. Available in both kit and ready-to-run form. Features a number of scale details, including an interior. Longtime aftermarket part manufacturer, Vanquish Products, recently released their own entry into the scale R/C landscape. Featuring an old-school body design and a plethora of high-end components, the VS4-10 is a 1/10-scale kit designed for those who want the best of the best right out of the box. Why Choose the Vanquish Products VS4-10? If you want a high-end trail machine without any noticeable need for upgrade parts. If you prefer to drive a rig that’s not quite mainstream, but still offers plenty of scale detail and realism, the SG4 line from Cross RC might be just what you’re looking for. This RTR platform features three different models, all offering injection-molded hard bodies, detailed interiors, detailed engine compartments, and LED lights. The three available trim levels all raise the bar in terms of realism, by offering additional accessories and features…for a price. Why Choose the Cross RC SG4 Demon? The SG4 Demon offers a boatload of scale detail for a price that’s comparable to many other models on the market. A blend of metal and hard plastic body components make for a durable and realistic trail truck. On the other end of the Cross RC trail truck lineup is the SR4 4×4 Demon. While the name is similar to the SG4, the SR4 offers an opportunity to get your hands dirty and build a trail machine from the ground up. This kit offers three trim levels, each with slightly more components and details than the previous. Again, these improvements come at a higher price. Why choose the Cross RC S4A Demon? Perfect for the hobbyist that loves to build their rig from the ground-up. Scale detail both inside and out.